I have not been reading nearly as much of late because I recently became particularly obsessed with the Canadian television series Slings & Arrows. It’s a comedy/drama unfolding around the New Burbage (spelling?) Theatre and particularly with the plays of Shakespeare and in wonderful Shakespearian style there’s a ghost, a madman, rivalry, revenge, passionate lovers, and even some blood. If you’re looking for something thoughtful and funny to watch: this is it. Unfortunately, there are only three seasons. 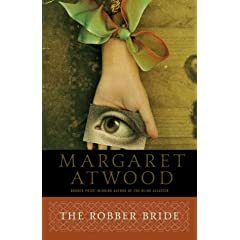 A few posts back I asked how reader’s decided which book to read next. I forgot to add that an excellent way to discover new writers and titles is asking at readings. Earlier in the year I heard two Canadian authors read. One was Steven Hayward author of The Secret Mitzvah of Lucio Burke (which I still have not read) and the other man I entirely forget (except that a group of us went back to a friend’s house and ate take out sushi). 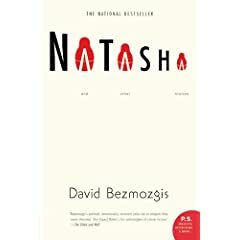 However, both of these authors recommended David Bezmozgis’ Natasha and Other Stories, and ever since then the collection has been sitting in the forefront of my mind as a must buy. And I did. Buy it, that is, and it definitely tops my list as a favorite purchase and read of 2007. Bezmozgis story collection follows the life of a family of Jewish Russian immigrants in Toronto, Ontario. To paraphrase from one of my favorite television shows Black Books: I laughed, I cried, it changed my life. The book does follow the same family in chronological order, so especially if you are not a fan of the short story format this is one to try.